Remember the food pyramid we were taught to memorize in school with the poster on our classroom walls? Well, it’s still hanging there in plain sight for our children and grand-kids to see. The USDA continues to provide Americans with our recommended dietary guidelines according to this model. It has “evolved” a bit since I was a kid, but according to a new book coming out next month titled Grain Brain, the foundation; 6-11 servings of Bread, Cereal, Rice and Pasta may in fact be killing us. 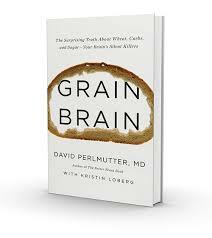 Renowned neurologist David Perlmutter, MD, blows the lid off a topic that’s been buried in medical literature for far too long: carbs are destroying your brain. And not just unhealthy carbs, but even healthy ones like whole grains can cause dementia, ADHD, anxiety, chronic headaches, depression, and much more. On this call Dr. Perlmutter will share what happens when the brain encounters common ingredients in your daily bread and fruit bowls, why your brain thrives on fat and cholesterol, and how you can spur the growth of new brain cells at any age. If celiac disease affects only about 1-2 % of the population, why all the concern about gluten? What’s so bad about carbs as far as the brain is concerned? What other brain issues are related to gluten sensitivity? What do you do all day – professionally? Why are American schoolchildren so unhealthy? You recently challenged the mainstream thesis of Alzheimer’s as being caused by a particular protein (beta-amyloid) please explain. When? Wednesday, August 7th, 8:00 pm Eastern. The event is free, but space it limited. Register here. The phrase “in plain site” in the first paragraph needs to be changed to the correct “in plain sight”. It’s hard to take seriously an article with such an obvious error, even if it’s just the correct usage of a particular word. Sorry! Well… That sure is embarrassing. Looks like I need to slow down. I certainly appreciate your bringing this typo to my attention. Have a terrific day! If you missed last night’s call you can listen to the recording here!